Your child’s first lesson with us is FREE, so Get Started today! Beginner classes: Babies with cares and pre-schoolers start their journey towards achieving confidence in the water and learning to swim through our early years program. Advanced and Squad classes: School aged children continue their skill development and move onto squad training through the various skills achieved in our program. Our programs are structured, developmental and each swimmer is individually assessed in an ongoing manner. Our experienced Pool Deck Coordinators are continually monitoring the progress of each swimmer and how well they are mastering each skill and their readiness for progressing to the next level. By having a flexible booking system, with no ‘locked in’ time periods we ensure that each swimmer is able to progress through each stage of our learn to swim program and be promoted as they achieve each swimming milestone. 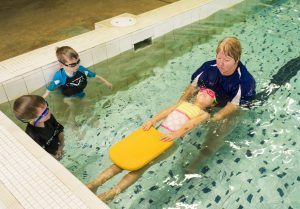 With Learn to Swim lessons catering for babies to seniors, our dedicated team of swimming instructors all have recognised ‘learn to swim’ (teaching) qualifications and are supported with ongoing training to ensure the best lessons possible are provided. We have small class sizes to make sure our instructors can focus on each swimmer and their individual needs. Following systematic and organized lesson formats ensures your child progresses at an appropriate rate and their skill development is optimised. Balanced lessons providing fun, activity, challenge and correct stroke technique. Water temperature is maintained at 32◦C which is recognized as the ideal temperature for swimmers to stay warm, comfortable and focused during their lessons. You can change your lesson time booking whenever you need to, subject to availability. Our payment options are flexible, affordable and cost effective. Our receptionist will work with you to identify the payment option that best meets your needs. We understand that what works best for one family may not suit another and of course, there are times when circumstances may change. You can renegotiate your payment options at any time. Casual, pay as you use – for lessons booked an used on the same day. * Our customers are not locked into a particular option. We allow you to swap and change between payment options in order to meet you personal circumstances. Learning to swim is important for all, and our aim is to ensure lessons remain affordable even for large families. Discounts apply if there are 3 or more children from one family attending swimming lessons at our Centre. There are many benefits that can be achieved by having a second learn to swim lesson each week. We offer a Frequent Swimmer discount to encourage and support this option as we have learnt over the years, children who swim frequently progress faster. Learning to swim is a skill for life. With lessons at our centre there are no ‘joining fees’ or set term periods. Swimming is a complex skill and we believe the best outcomes for your child are achieved when they can swim regularly. We therefore run our lessons year round, with short Christmas and Easter breaks. We also offer a school holiday program where your child can participate in an intensive program each day to boost their confidence.